The Dnieper River /ˈniːpər/ or /dəˈnjɛpər/ (also known as: Dnepr, Dnyapro or Dnipro) is one of the major rivers of Europe (fourth by length), rising near Smolensk, Russia and flowing through Russia, Belarus and Ukraine to the Black Sea. It is the longest river of Ukraine and Belarus and the fourth longest river in Europe. The total length ranges between 2,145 km (1,333 mi) and 2,201 km (1,368 mi) with a drainage basin of 504,000 square kilometres (195,000 sq mi). The river is noted for its dams and hydroelectric stations. The Dnieper is an important navigable waterway for the economy of Ukraine and is connected via the Dnieper–Bug Canal to other waterways in Europe. In antiquity, the river was known to the Greeks as the Borysthenes and was part of the Amber Road. 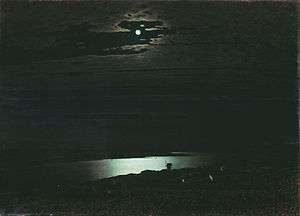 Arheimar, a capital of the Goths, was located on the Dnieper, according to the Hervarar saga. The name Dnieper is derived from Sarmatian Dānu apara "the river on the far side". (By contrast, the Dniester derives from "the close river".) According to V. Abaev (expert on Scytho-Sarmatian languages) the name Dnieper derives from Scythian Dānu apr (Dānapr) "deep river", while the name Dniester is combination of Scythian Dānu (river) and Thracian Ister, the old name of Dniester. Ukrainian: Днiпро (Dnipro, [dnʲiˈpro]) or Дніпер (Dniper, [ˈdnʲipɛr]). The river is mentioned by the Ancient Greek historian Herodotus in the 5th century BC as Borysthenes (Βορυσθένης), as well as by Strabo; this name is Scythian (cf. Iranian *varu-stāna) and translates as "wide land", referring most likely to the Ukrainian steppe. The late Greek and Roman authors called it Δάναπρις - Danapris and Danaper respectively - (dana in Old Persian meant "river"); this form is derived from Sarmatian Dānu apara "the river on the far side". Its Old East Slavic name used at the time of Kievan Rus' was Slavuta or Slavutych, the Huns called it Var, and Bulgars - Buri-Chai. The name in Crimean Tatar: Özü. The total length of the river is 2,145 kilometres (1,333 mi), of which 485 km (301 mi) are within Russia, 700 km (430 mi) are within Belarus, and 1,095 km (680 mi) are within Ukraine. Its basin covers 504,000 square kilometres (195,000 sq mi), of which 289,000 km2 (112,000 sq mi) are within Ukraine, 118,360 km2 (45,700 sq mi) are within Belarus. On the Dnepr River to the south of Komarin urban-type settlement, Braghin District, Gomel Region the southern extreme point of Belarus is situated. Dnieper Rapids were part of trade route from the Varangians to the Greeks, first mentioned in the Kiev Chronicle. The route was probably established in the late eighth and early ninth centuries and gained significant importance from the tenth until the first third of the eleventh century. 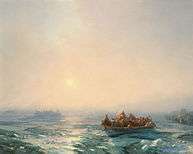 On the Dnieper the Varangians had to portage their ships round seven rapids, where they had to be on guard for Pecheneg nomads. From the mouth of Prypiat River to Kakhovka Hydroelectric Station is a cascade of dams and hydroelectric stations. The most noted was the Dnieper Hydroelectric Station or (DniproHES) near Zaporizhia, built in 1927–1932 with an output of 558 MW. It was destroyed during the Second World War, and rebuilt in 1948 with an output of 750 MW. The others are: Kakhovka (1950–56), Kremenchuk (1954–60), Kiev (1960–64), Kamianske (1956–64), Kaniv (1963–75). Those dams that used to generate hydroelectric power of ten percent of Ukraine's total electricity, form water reservoirs. The reservoirs are Kiev (922 km2 or 356 sq mi), Kaniv (675 km2 or 261 sq mi), Kremenchuk (2,250 km2 or 870 sq mi), Kamianske (567 km2 or 219 sq mi), Dnipro (420 km2 or 160 sq mi), and Kakhovka (2,155 km2 or 832 sq mi). 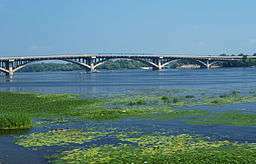 Upstream from Kiev, the Dnieper receives the water of the Pripyat River. This navigable river connects to the Dnieper-Bug canal, the link with the Bug River. Historically, a connection with the Western European waterways was possible, but a weir without a ship lock near the town of Brest has interrupted this international waterway. Poor political relations between Western Europe and Belarus mean there is little likelihood of re-opening this waterway in the near future. Navigation is interrupted each year by freezing in winter, and severe winter storms. The river is one of the symbols of the Ukrainian nation. The river mentioned in the national anthem of Ukraine. 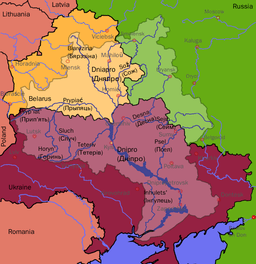 There are several names that connect the name of the river with Ukraine: Overdnieper Ukraine, Right-bank Ukraine, Left-bank Ukraine, and others. Some of the cities on its banks — Dnipropetrovsk, Dniprorudne, Kamianka-Dniprovska — are named after the river. The Zaporozhian Cossacks lived on the lower Dniepr and their name refers to their location "beyond the rapids". Briefly mentioned in the science fiction/adventure novel The Crisis Pendant by Charlie Patterson. The Dnieper River is close to the Prydniprovsky Chemical Plant radioactive dumps (near Kamianske), and susceptible to leakages of radioactive waste. The river is also close to the Chernobyl Nuclear Power Station (Chernobyl Exclusion Zone) that is located next to the mouth of the Prypiat River. 1 2 3 4 "Main Geographic Characteristics of the Republic of Belarus. Main characteristics of the largest rivers of Belarus". Land of Ancestors. Data of the Ministry of Natural Resources and Environmental Protection of the Republic of Belarus. 2011. Retrieved 27 September 2013. ↑ Mishyna, Liliana. 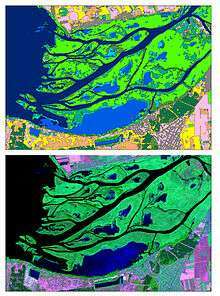 Hydrographic research of Dnieper river. Derzhhidrohrafiya. ↑ Словарь української мови / Упор. з дод. влас. матеріалу Б. Грінченко : в 4-х т. — К. : Вид-во Академії наук Української РСР, 1958. Том 1, ст. 394. 1 2 Kubiyovych, Volodymyr; Ivan Teslia. 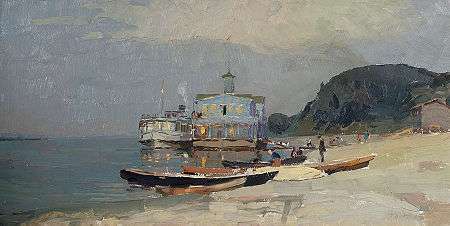 "Dnieper River". Encyclopedia of Ukraine. Retrieved January 19, 2007. ↑ "Main Geographic Characteristics of the Republic of Belarus. Coordinates of the extreme points of the state frontier". Land of Ancestors. The Scientific and Production State Republican Unitary Enterprise "National Cadastre Agency" of the State Property Committee of the Republic of Belarus. 2011. Retrieved 20 September 2013. 1 2 Benson, AJ. "Dreissena rostriformis bugensis Andrusov, 1897". Nonindigenous Aquatic Species. United States Geological Survey. Retrieved 2 May 2014. ↑ "An English translation of Hervar saga by Kershaw". Archived from the original on 2006-03-28. Retrieved 2006-03-28. ↑ NoorderSoft Waterways Database Archived November 9, 2005, at the Wayback Machine. ↑ Work on the subject Ukrainian national symbols. Library of Ukrainian literature. ↑ "...the Zaporohjans whose name meant 'those who live beyond the cataracts'...", Henryk Sienkiewicz, With Fire and Sword, chap. 7.